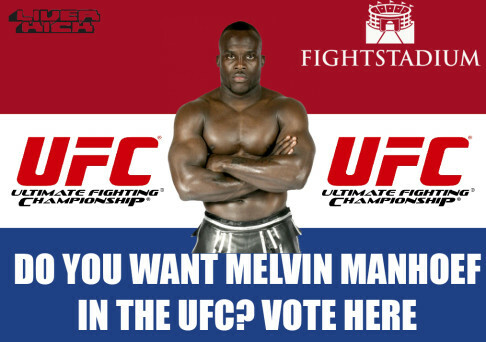 Do you want MELVIN MANHOEF in the UFC? VOTE HERE! Discussion in 'The Lightweights' started by Rollermanskunk, Jun 5, 2014. He's already in UFC unless I missed something. Win or lose someone is getting a finish added to their highlight reel. He will get finished quick or he will finish someone in quick fashion. Sure before it's too late. The UFC has picked up much worse talent. I dont see what the problem would be by picking up a good exciting striker that Justbleed fans would love. In the build up to his debut they can replay highlights of the Cyborg fight and him knocking out Hunt while Joe Rogan screams in the background hyping him up. Why not? Put him in some fun fights. He doesn't seem to have the skillset to be a champion, but he will draw more fans. Sure before it's too late. The UFC was picked up much worse talent. I dont see what the problem would be by picking up a good exciting striker that Justbleed fans would love. In the build up to his debut they can replay highlights of the Cyborg fight and him knocking out Hunt while Joe Rogan screams in the background hyping him up. And the new favorite sound bite "THIS IS MADNESS"